Water features introduce many interesting elements to your garden including the sound of running water, and different habitats in and around the water for many different types of plants, fish and frogs. 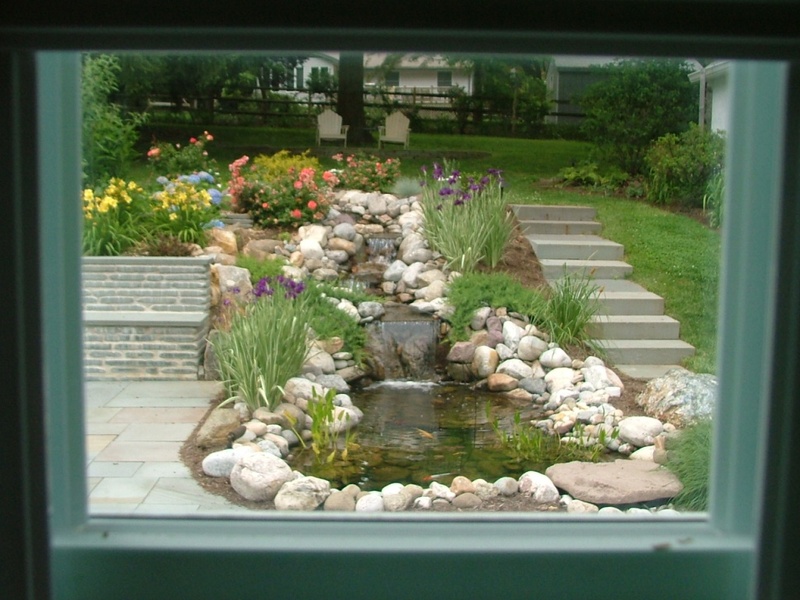 A small pond can add another element to your enjoyment of your outdoor living space. 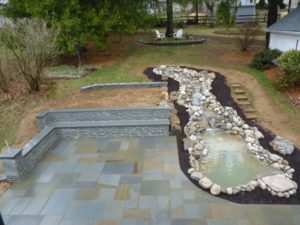 If low maintenance is your main goal a pondless waterfall might be just the thing. 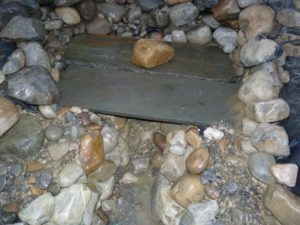 A small stream of water is like a magnet to the birds on a hot summers day and the sound of a small waterfall or fountain can be very relaxing. 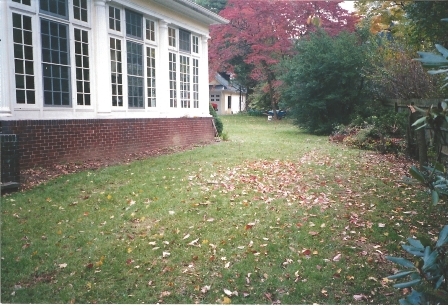 Before photo of the grass hill sloping towards the house. This is actually a nice situation for viewing the pond and waterfalls from the house. The placement for the patio and wall is outlined with white paint. 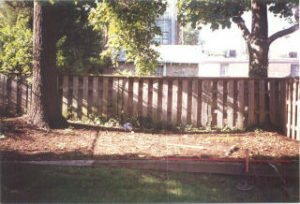 Before photo. 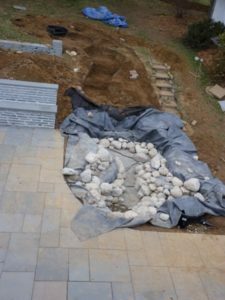 The hill will allow for more waterfalls, but a waterfall can be constructed in a level back yard by using the soil excavated for the pond to make the hill for the waterfall. 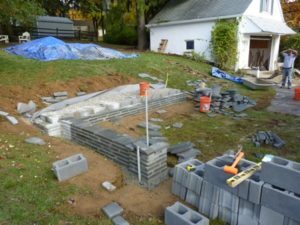 Construction of the wall. 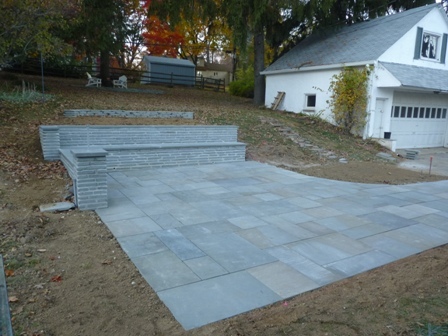 Tumbled flagstone wall installed on two levels to make a seat around the patio with the top level used as a seat back. The wall completed, and the patio roughly outlined in white. 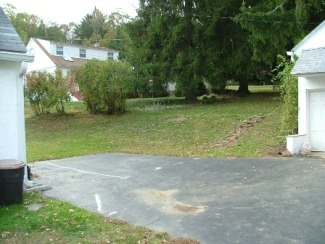 The blacktop must be removed from the patio and pond area. The view of the patio, pond, and wall area from above. 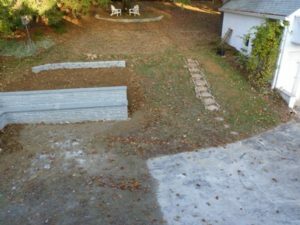 The completed patio with a curve built into the corner to allow for the pond in tight to the patio. 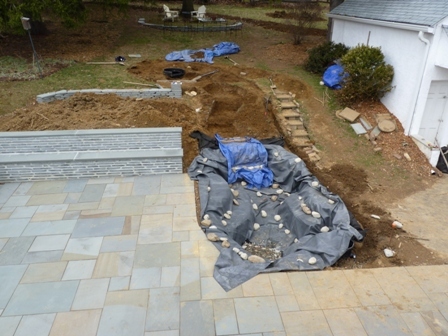 Before shot of the pond with the wall and completed patio. Pond and stream outlined with white spray paint. White square at the lower right of the pond area is for the skimmer. 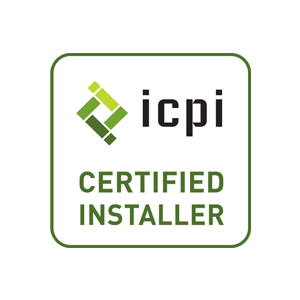 Underlayment is installed before the liner. 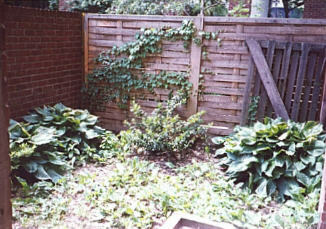 It is the darker gray fabric seen seen at the top of this and the next couple of photos. 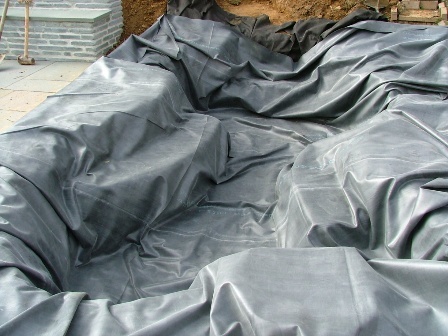 This helps protect the liner and also helps the soil to release any gases from under the liner. The skimmer is dug in and placed at the proper level (under the liner in the lower right). A 45 mil. one piece EPDM liner is installed over the underlayment; it easily conforms to the shape of the cut out. The stream is also dug out and the Biofalls filter can be seen dug in at the top of the stream. 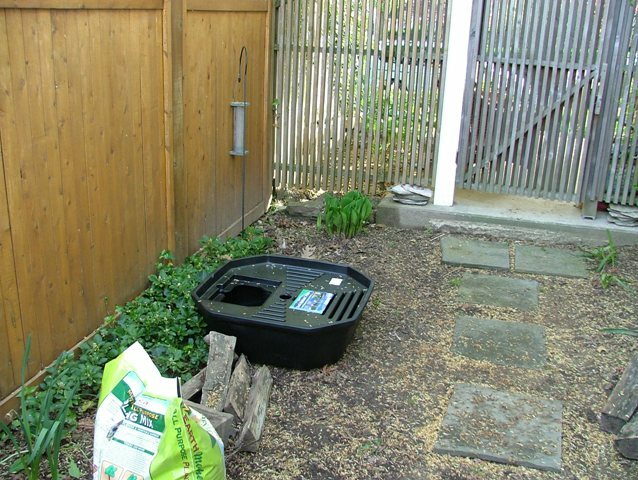 The plumbing is completed between the Biofalls filter and the skimmer. 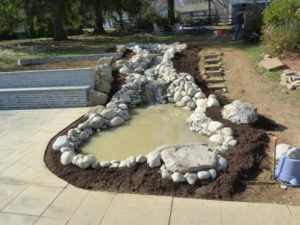 The pond is rocked in on the bottom and sides. 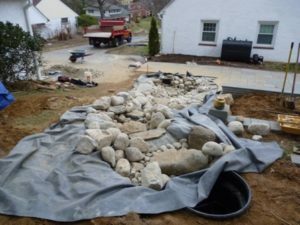 The underlayment and liner are installed in the stream and the waterfalls constructed. Extra liner is left along the edges at this time to help prevent water escaping over the top. The stream seen from the top. The liner will be trimmed later, but it is left high to allow for a little settling. The liner is attached to the front of the Biofalls with a special connection. Two large flagstone pieces were used to help make a fish cave to help protect the fish from predators. The fish did not come out with people around for the first month. Eventually they got used to their surroundings and felt safer leaving the cave. 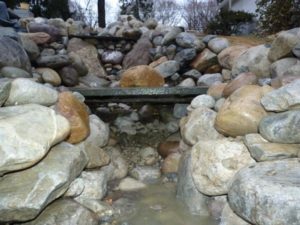 The fish cave from below before filling the pond with water. The completed pond before the water has been cleaned out, and the area landscaped. 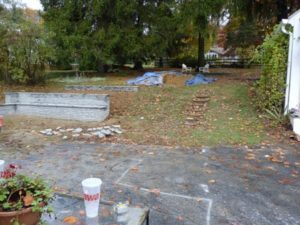 New steps will also be constructed on the side of the pond. Electric is usually best brought in after construction in case underground obstacles force a different placement of the skimmer. 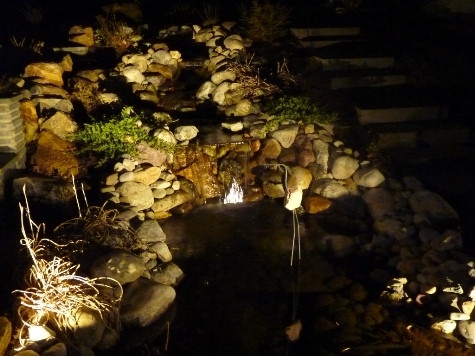 Here is the pond with lights – taken in March. 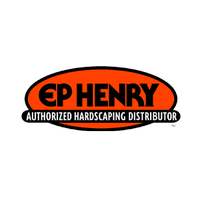 Night lighting with low voltage LED lights can bring hours of additional beauty to your landscape; plus by highlighting only the best views your yard can look better at night than it does during the day. Here is the view looking out the window from the house. 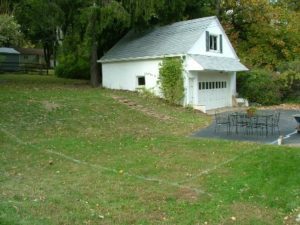 You can see how the proximity to the house can be used to enhance the view, and the advantage used here of having the hill falling toward the house. 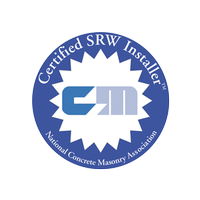 If you go back to the before photos in the construction details above, this advantage is not necessarily obvious to the amateur. 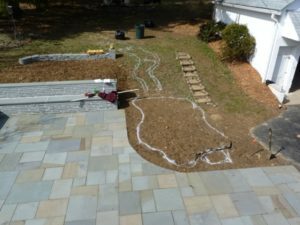 Fountains and small water features can be the right choice for the smaller property or the person who wants the benefits of water in the garden without the maintenance. 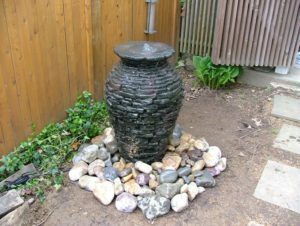 The also is a cost benefit for a smaller water feature. 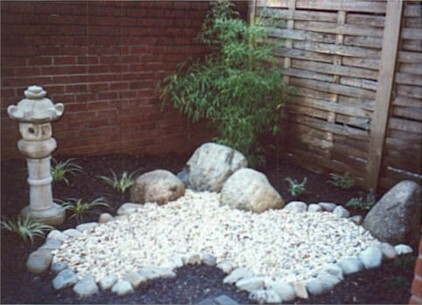 Shown here is a Aquascape fountain with some of the materials involved. 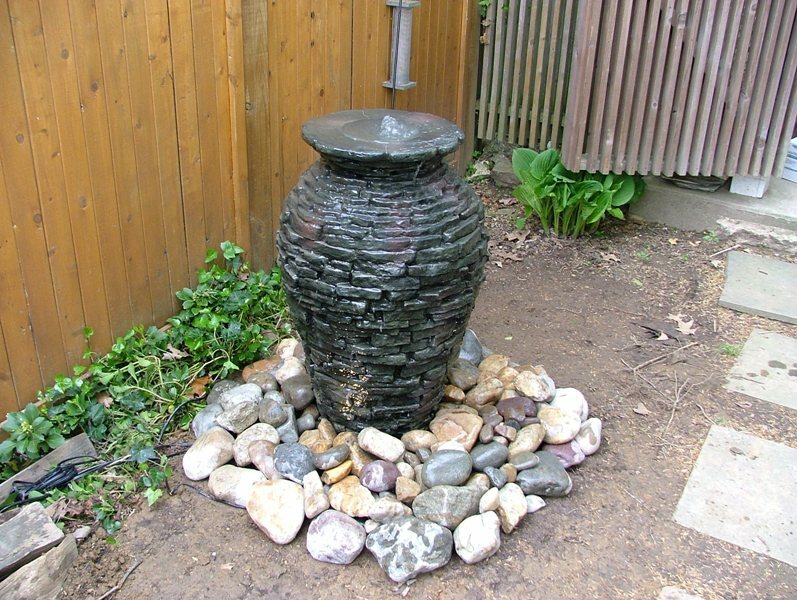 All that was used here was an Aquabasin, a pump, and an urn that was already prepared as a fountain. Before: Small Aquabasin holds the water. 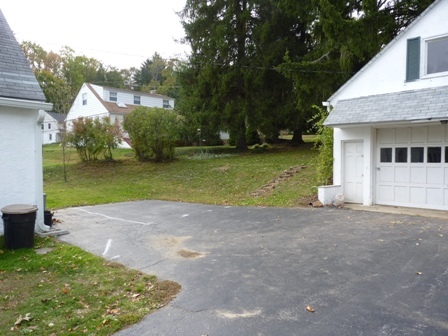 It has a opening on the top for access and pump installation. Aquabasin is buried and covered with river rock. 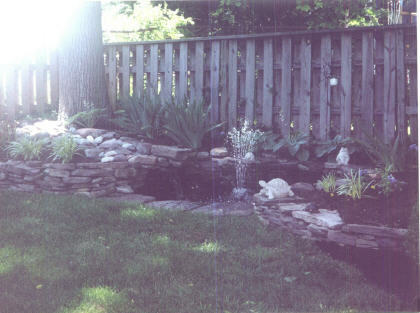 After: Finished fountain with low voltage LED lights, so fountain can be seen and enjoyed at night. Fountain can be turned off when you are not at home. 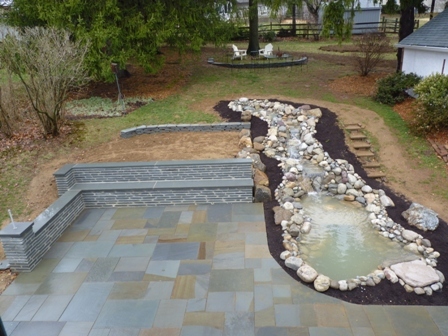 A short video showing the finished fountain and the sound of the water from the fountain. Low voltage LED lights are also installed so the fountain can be enjoyed at night. 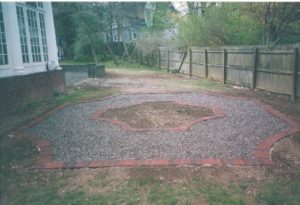 This fountain and landscaping was set off with a bed of Peas Gravel bordered with paving brick. 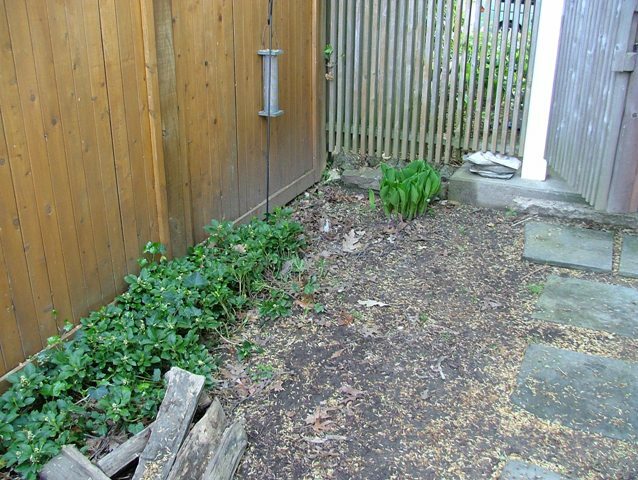 Conduit for electricity was buried under the pea gravel bed so an electrician could put in a GFCI outlet. 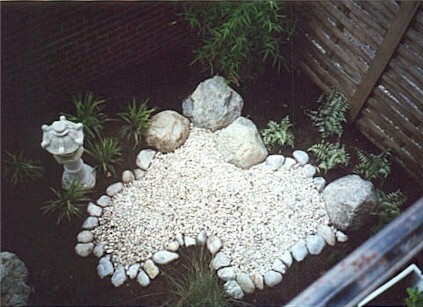 The area was planted before the water feature was selected. 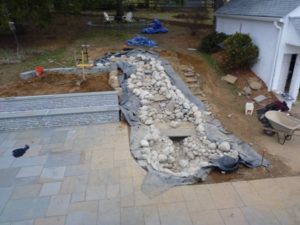 The owners picked out and purchased the water feature and we installed it after the electrician installed the proper outlet. This was one part of a larger renovation project. 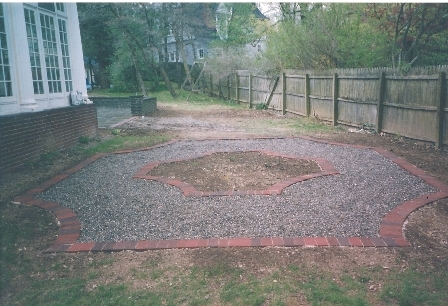 Click here to see the patio with landscaping. 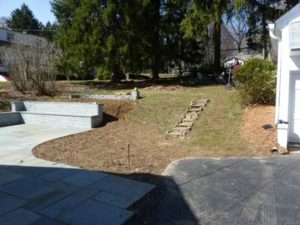 After: With Fountain and landscaping a few years after planting. 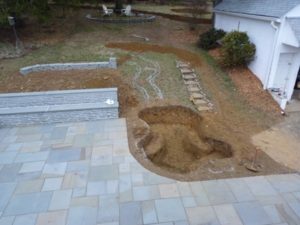 This backyard pond has the water pumped up into a small stream created on the upper level and originates behind a tree to hide the source. 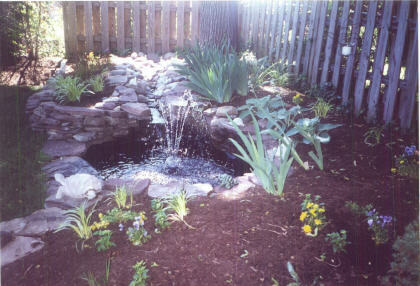 The stream reenters the pond with a small waterfall. the pond also has a small fountain and the pump can be regulated to send more water to the stream or the fountain. This small pond was constructed with a pre-formed PVC pond liner, with an EPDM liner used for the upper stream. 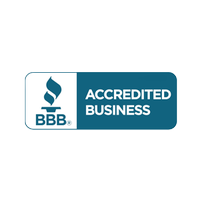 It was constructed before we started using the Aquascape system. Grasses, irises, hosta, and other plants commonly seen near water were used to landscape around the pond. 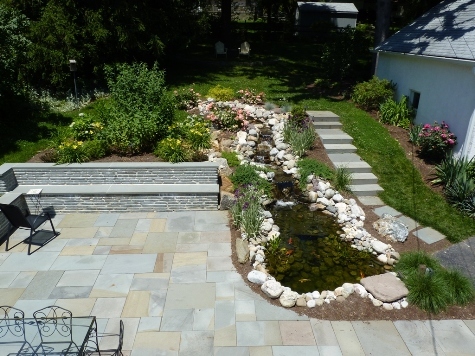 This idea borrowed from Japan uses rounded river rocks to simulate water. 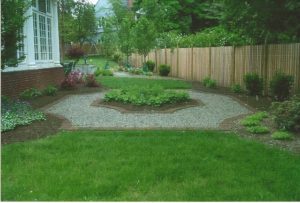 Small boulder are used on the edges and plantings are made up of plants commonly seen growing near water. This type of garden is not affected by drought restrictions and does not need the maintenance sometimes necessary with water features. 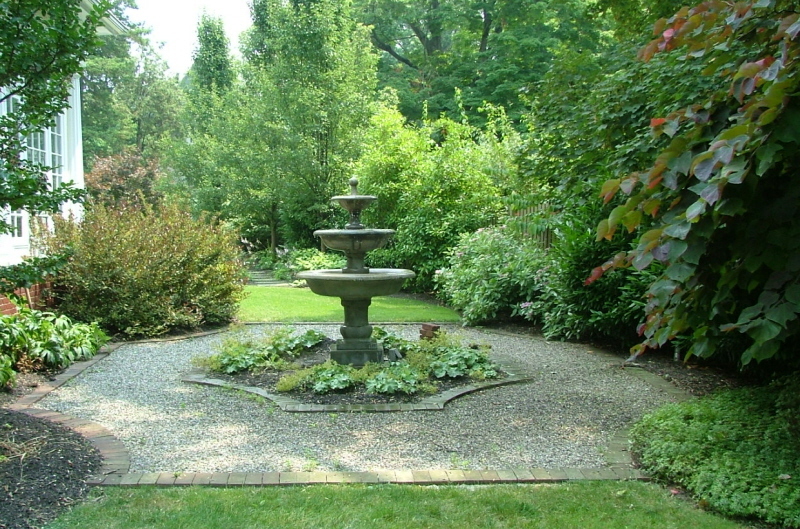 This garden is viewed when entering residence and can be seen from the second floor living area.